After gulping down a glass of the complementary Prosecco in my hotel room and wisely deciding not to pour the rest of it into my water bottle, I rushed out to see Rome. I’ve said those words myself, and meant them. It’s a nice sentiment. But I had come 5,000 miles and although things were less expensive during the low season, I was still spending plenty of money on this trip. Why not pack in as much in as possible? Life is short, so before it got dark—in three hours—I was determined to at least scope out the Coliseum, the Roman Forum, Palatine Hill, and the Pantheon. 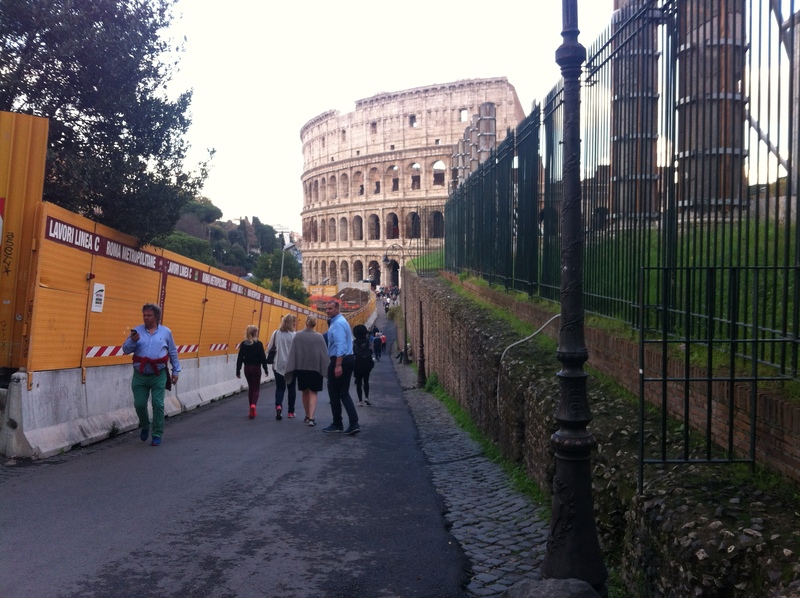 The Coliseum appeared to be a few short blocks away. But “a few blocks” in Rome, for me, meant getting lost immediately, several attempts to surreptitiously look at my map, asking strangers for directions, stumbling upon the almost 2000-year-old Trajan’s Column, being distracted by block after block of Roman ruins, consulting the map again, getting lost again, and saying no to a dozen African immigrants selling selfie sticks along the way. 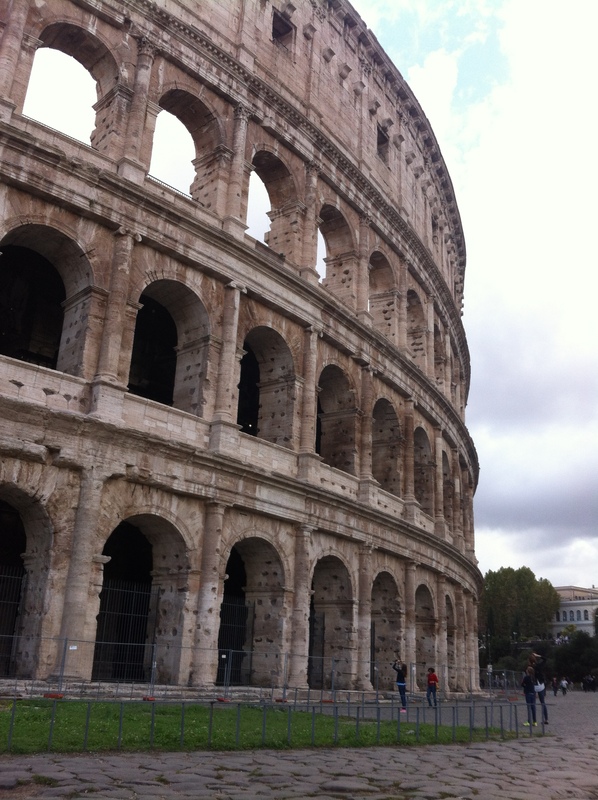 How would I ever find the Coliseum? Then I turned a corner, and there it was. Wow. It’s one of those places you’ve seen in photos and movies hundreds of times but which still takes your breath away. I wasn’t going in today, but I walked around it. And I slowed down, savoring this rare feeling of awe. I had read and re-read descriptions of the sites, and they hadn’t given me a sense of their scope or how to tackle them. Google maps are great, but they don’t indicate elevation. So one thing appears close to another, but you don’t know about the 400 steps until you’re looking up at them from the bottom. The Roman forum isn’t one thing; it’s a collection of hundreds of ruins including some intact buildings scattered over a huge swath of land adjacent to the Coliseum. Apparently there were dozens exits but only one entrance, and that was a closely-held secret. Palatine Hill is, thankfully, a real hill, but because everything is so packed together, I couldn’t back up enough to get perspective and see where it was. Se il file non viene visualizzato correttamente è possibile scaricare il programma Adobe Acrobat Reader cliccando qui La fattura non sarà inviata tramite posta. Ricordiamo inoltre che è comunque necessario STAMPARE LA FATTURA E CONSERVARLA ai fini delle vigenti disposizioni di legge. La fattura resterà a disposizione per almeno 1 anno. ATTENZIONE: questo è una email AUTOMATICA, pertanto vi preghiamo di NON RISPONDERE a questo messaggio per avere assistenza. The links led to a receipt. I knew enough Spanish to decipher that I was supposed to pay attention to something, save something, and not respond to this automated message. I took my time strolling back to the hotel, retracing my steps, already feeling familiar with landmarks and knowing I could easily find my way back when I returned in two days. This entry was posted in Adventure, Budget travel, Culture shock, Joie de vivre, Travel and tagged Italy, Rome, travel on December 9, 2016 by Breaking Free.